Better risk, compliance, incident & breach management. Tickit On Demand is the ideal risk, compliance and incident management solution for Financial Services organisations. Tickit On Demand is intuitive, easy to use and available at a fair price. Tickit On Demand is aligned with the ISO 31000 risk management standard, AS/NZS 4360 risk management standard and AS/NZS 3806 compliance standard. Tickit On Demand provides a structured framework for risk management, compliance management, incident management, complaint management, audit issue management and much more. Tickit will allow you to create your own report templates choose the fields you want, rename reports and subscribe to get them at a regular frequency. Reports such as the Overdue tasks report, automatically provides an age analysis of overdue tasks at the click of a button, which would usually take hours to generate manually. Every Tickit On Demand customer gets telephone and email support, training manuals and online help files included in our license fees. Tickit On Demand is hosted on our fast and reliable servers. All you need is a computer, web browser and an internet connection. Getting assurance that compliance, risks and incident are being managed does not be a complex process. Tickit On Demand can save your staff time with its effective and intuitive approach to compliance, risk and incident management. Information is easily managed and accessed in a single database and reports that would otherwise take hours can be generated at the click of a button. 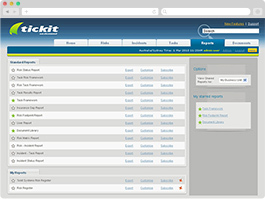 Load your compliance obligations in Tickit On Demand and manage them yourself. Easily allocate obligations to staff in the business and track task completion. Our Financial Services clients manage obligations from their Australian Financial Services License (AFSL), Corporations Act and a range of other legislation and regulations. They even manage compliance against internal policies and procedures and track whether audit findings have been completed. You configure your own incident/breach reporting form or even a complaints reporting form. These forms can be published on your intranet making them easily accessible to anyone in the organisation to report an incident or a potential breach.